How can a church - rooted in sacramental tradition - build a future-focused, mission-shaped identity? With that question in mind, Steven Croft, Ian Mobsby and Stephanie Spellers pull together stories and reflections to outline how spiritual practices and insights of leaders and theologians from US and UK contribute to the mission effort in "our postmodern, de-churched, never-churched, yet spiritually hungry society." 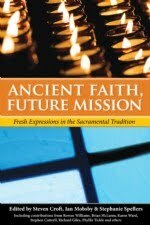 Their efforts can be found in Ancient Faith, Future Mission: Fresh Expressions in the Sacramental Tradition, published by Seabury Books (a division of Church Publishing). This book grew out of an English edition initially published in 2009 by Steven Croft and Ian Mobsby following the Fresh Expressions conference. Spellers helped to edit the new edition, for the American church. The book, Spellers said, is designed to provide a resource for historically liturgical churches, many of whom are part of the Anglican or Episcopal faith, who honor the catholic tradition, but desire to do things in a missional context. Throughout the essays, written by individuals such as Brian McLaren, Phyllis Tickle, Rowan Williams and Richard Giles, the editors strive to find ways that not only honor that worship tradition, but transform lives in new ways. Spellers, who serves as the lead priest at The Crossing in Boston, said ultimately this book is for those working in churches who strive to have "one foot in the ancient tradition and one foot in today." She said the Fresh Expressions conference wanted to find a ways to do church " that meets our culture and life in all of its multiplicity" but did not "throw the baby out with the bath water," when it comes to tradition passed down through the ages. The book, she explained, is filled with stories of communities and leaders who share a commitment to doing work, not in a reactive mode, but strive to change when needed to promote the gospel. What I liked about this book is that it looks a a variety of things and how the church can continue to honor tradition in new ways. Reading it has given me a lot to think about, especially as the denomination I work for continues to reshape its identity. The Rev. Stephanie Spellers is the priest and lead organizer at The Crossing, the emergent community based at the Cathedral Church of St. Paul in Boston. She is the author of Radical Welcome: Embracing God, the other and the Spirit of Transformation. She leads workshops on that theme around the country. Steven Croft is the Bishop of Sheffield. From 2004 to 2009 he was Archbishops Missioner and Team Leader of Fresh Expressions. Former warden of Cranmer Hall, he spent 13 years in parish ministry. Ian Mobsby is a priest missioner in the Church of England, currently with the Moot Community in London. He has more than 20 years experience working with emerging and fresh expressions of church. As a freelance journalist, I was provided a copy of this book for review. That review copy did not influence this review - just in case the FCC is reading the post and wondering.